Sue discusses her Achilles bone spur surgery and UFAI experience. A Heel Spur (also called retrocalcaneal exostosis or an "Achilles Heel Spur) is the overgrowth of bone on the back of the heel. This painful condition is often related to the chronic tugging of a tight Achilles tendon on the heel bone (calcaneus). The bone spur can destroy the attachment of the Achilles tendon so it is important to seek proper medical attention at the onset of the condition. This condition typically affects adults, and because of the types of shoes women wear, they are more at risk. Why University Foot and Ankle Institute for Heel Spur Treatment? Patients may experience pain, swelling, redness and a bony bump along the back of the heel bone. Symptoms often increase with activity or shoes that rub the back of the heel. As the bone spur develops, it becomes increasingly painful to wear shoes. If surgery becomes necessary, removal of scar tissue with the Topaz procedure may be used to remove scar tissue and increase blood supply to the tendon. This does not eliminate the heel bone spur, but can relieve swelling to the Achilles and reduce pain. Read more about the Topaz procedure here. If spur removal is required, the procedure may be done arthroscopically to limit the incision and trauma to the area. Surgery with an open incision may be needed in severe cases. The key to a good outcome is a solid reattachment of the Achilles tendon and complete removal of scar tissue and bone spurs. The team of physicians at University Foot and Ankle Institute have decades of extensive experience treating Achilles conditions and spur removal related to retrocalcaneal exostosis. Their doctors have decades of combined experience in the conservative and surgical care of Achilles tendinosis and heel spur removal related to retrocalcaneal exostosis. 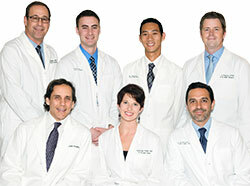 We are pleased to offer multiple locations throughout Greater Los Angeles and Southern California. Our Valencia, Sherman Oaks, Beverly Hills, Manhattan Beach, West Los Angeles and Santa Monica Podiatry locations offer a range of services. These include full radiology, MRI, neurosensory nerve testing, and ultrasound. This means you will rarely have to go from office to office if tests are ordered. We are also proud to offer state of the art surgical centers and physical therapy services conveniently located within our Valencia and Santa Monica Podiatry offices and close to our other locations. Our advanced services get you back on your feet and back to your life in the least amount time possible!